Good Old Games has announced the triumphant releases of both Zork and Police Quest. Last week, Good Old Games was hiding something related to Zork behind police tape as a tease. The tease's purpose has been revealed by GOG's official announcement of a Zork Anthology release, but with it comes another series that makes a whole lot of sense based on that tape. GOG's tease was apparently a two-for-one, as that police tape wasn't just ensuring that citizens stay away from Zork. It was also referring to GOG's release of a Police Quest collection, which was also just announced. As the most popular text adventures in videogame history, the Zork games should need no introduction. For a measly $5.99, GOG's Zork Anthology includes Zork, Zork II, Zork III, Beyond Zork, and Zork Zero. It also throws in Planetfall for good measure, a sci-fi text adventure written by Steve Meretzky that follows an Ensign on a starship. The Police Quest collection includes Police Quest, Police Quest 2, Police Quest 3, and Police Quest 4 for $9.99. All are similar to classic Sierra graphical adventure games such as King's Quest and Space Quest, but with a real world twist. 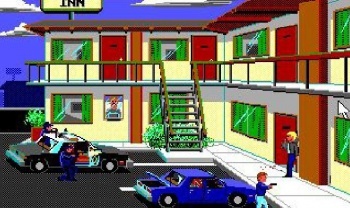 The Police Quest games offer crime-based storylines with realistic characters, and were even designed with the help of actual top cops. The mix of Zork with Police Quest is kind of like a chicken sandwich topped with a burger. Nobody knows why the two were put together, but hey, why not enjoy both at the same time?